Very cool - interesting how much they heel the boat to windward. Yes they do. A quick google found at least 3 different explanation as to why they do this. Whatever the physics, apparently it works. Boy, those guys sure know how to promote a class. Very, very classy. We need a Moth fleet in New England. 5 of the 12 sailors at the Moth Nationals came from New England. And the Moth Atlantic Coasts were sailed at Newport last year. My 3 grandsons have been feasting on the two Moth videos which I posted in the last few days. Even little Andrew (not yet 2) comes up to me and begs for "boats boats boats" meaning he wants to watch the videos again and then wriggles with excitement as he watches them. One of my two older grandsons wisely noted, "These are faster than your boat, Granddad!" Yes, just a bit. If you like the Gorge you might like to try yourself a little windsurfing. Good conditions there Lord T! I have tried windsurfing, Several times actually. I think it's a bit like golf in that if I had a whole lifetime to spare I might eventually be OK at it. But maybe not. I am actually quite bad at most things that involve balancing while standing up. I used to be an avid skier but was never much more than a low intermediate. And I never did master skating. So I think I will just stay focused on being a slightly less mediocre Laser sailor and trying to learn how to be a better than barely competent RS Aero sailor. Thanks for the thought though, Lord Puffin! After many, many moons being absent from the Blogworld, I have just come back and found your posts on my "reading list", whilst looking at my dashboard after ages. The Gorge had been on my to do bucket list during my active windsurf years, but such is life. You cannot do it all. It is a little late now as I realized last weekend, taking out the slalom surf gear after 15 years of grown dust. Everyone goes abt. 50km/h and I did abt. 38km/h. Oh, those GPS´s tell it all. 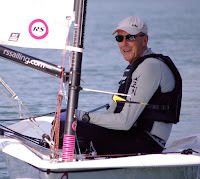 Maybe reading your great blog will pull me back into the blogging world of sailing. I still love it. Good to hear from you Fred. Maybe we will sail Aeros together in the Gorge one year. 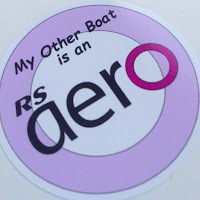 I do know that the folks out there are already planning an even bigger and better event for next year - this time for RS Aeros only. That sound like a great idea! Is should charter one boat or buy one and sell afterwards.